Baseball Team Downs McDaniel | The Gettysburgian. Last week, the Gettysburg College baseball team took part in the sixth annual Take ALS Yard Day, facing off against McDaniel College on Kirchhoff Field. The event is held every year to raise money for Project ALS. 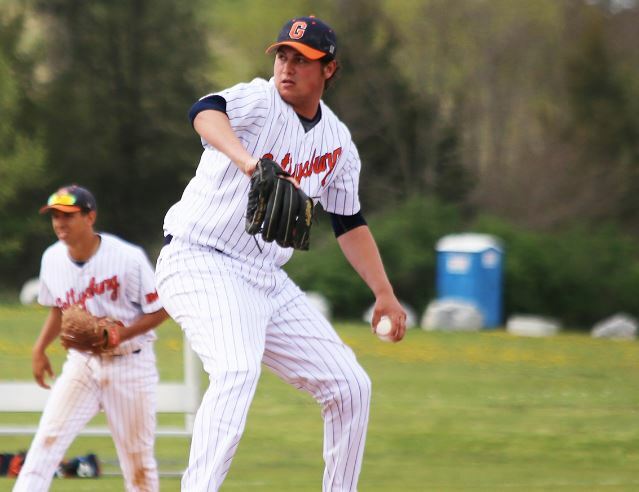 Senior Brad DeMartino threw his second straight complete game, giving up eight hits en route 4-2 Centennial Conference victory. Fellow senior Josh Cubell gave the Bullets the lead in the fourth inning with a two-run single, which would be enough to give them the lead for the rest of the game. First-year Sean Murphy also played an important role in securing the Bullets victory. He went 2 for 4 with two doubles and two RBIs. Six days prior, DeMartino had given up only four hits in a 3-1 victory over Swarthmore College. In his game against McDaniel, he was able to continue that success, striking out three batters and giving up zero walks. His performance only got better as the game went on, where he allowed only two hits over the final five innings. The Bullets were able to spot themselves some runs early in the game. In the first inning, first-year Matt Szczesny was hit by a pitch, which was followed up by sophomore Joe Giovinco reaching base safely on an infield single. After senior Logan Sneed reached first on a fielder’s choice, Murphy crushed a double to right field, clearing the bases and giving the Bullets a 2-0 lead. In the third inning, McDaniel was able to come back and tie the score at 2. With two outs, they hit three straight singles to send two baserunners to home. However, in the next inning the Bullets answered right back. Back to back hits from Sneed and Murphy put runners at second and third. Cubell followed Murphy, and with some decisive hitting was able to take a 2-0 pitch into the outfield just over the heads of the drawn-in infield. DeMartino took control of the game at this point, retiring nine straight batters and not allowing anyone past first base. He ended the game with a total of 124 pitches, recording his eighth career complete game and his 16th career victory. Gettysburg ended their Centennial Conference games with a doubleheader against Haverford College, where they split the games.